When Obama nominated current White House chief of staff and former Office of Management and Budget Director Jack Lew for Treasury Secretary all the main stream press could talk about was his loopy signature. What they are not amplifying is Jack Lew's Wall Street connections and ties to think tanks which often promote corporate centric policies that harm the U.S. middle class. Read more about Who Knew Jack Lew? Food stamp usage has soared to a new record high of 47,102,780. As of August 2012, 1 in 6.7 people are on food stamps in the United States. That's 15.0% of people living in America are on food assistance. The United States population in middle of August 2012 was 314,484,000 and this figure includes everyone, including Americans overseas. 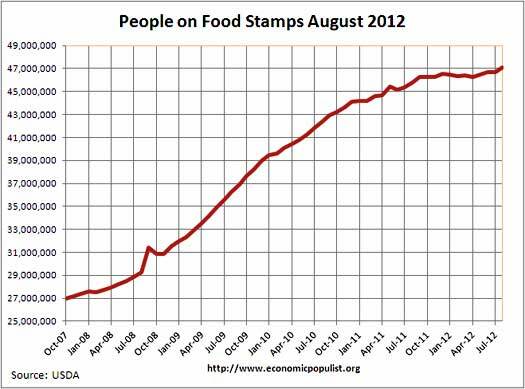 Food stamp usage increased 2.9% from August 2011 and 0.9% from July 2012. Since October 2007, food stamp usage has increased 74.4%. Population has increased 3.9% during the same time period. That is how badly America is hurting. With the New Hampshire primary coming round tomorrow, we're finally seeing a few solid articles worth reading. Some Journalists are digging deep into a few Republican candidates' background and economic philosophies. We pulled up a few articles worth your eyeballs to read in a sea of spin, polls and gotchas.